1. There will be no entry fees for this department. 2. All entries must be either framed or canvas stretched or matted on construction or illustration board. Each entry must have an attachment suitable for hanging. Entries not meeting these requirements will be rejected. 3. All entries must be the work of the exhibitor. 4. No identification should show on the front of the entry. 5. If any entry, in the opinion of the judge, is not entered in its proper class it will not be considered in the award of premiums. 6. Entries will be accepted between 1:00 p.m. and 4:00 p.m. Sunday before the fair and between 8:00 a.m. and 12:00 noon Monday of the fair. Entries must be in place by 12:00 noon Monday of the fair and must remain on exhibit throughout the entire fair. Items will be released between 12:00 noon and 4:00 p.m. Sunday after the fair. 7. Premiums for this department must be picked up at the Art Department during the release times listed in rule 6. 8. The Fair Board and its Directors will not be responsible for the loss of exhibits or ribbons. 7. Ribbons for 1st, 2nd, and 3rd place will be awarded in each class. Premiums for each class will be 1st Place – $3.00 and 2nd Place – $2.00. The best entry as selected by the judge will be awarded a rosette in each category for both the Adult (i.e. Oil, Acrylics, Water Color, etc.) and Junior (i.e. 6 to 9 Years Old, 10 to 15 Years Old, etc.) Divisions. Best in Show Rosettes will be awarded to one Adult Division entry and one Junior Division entry. 8. Exhibitors are limited to two entries per class. The same work may not be exhibited in both the Adult & Junior Divisions. 9. Decisions of the judge or judges will be final. 10. All premiums for an exhibitor that total less than $10.00 will be paid in cash at the time the exhibits are released. The exhibitor must sign a voucher stating that they have received payment. Premiums of $10.00 or more will be paid by check, but must be picked up at the time exhibits are released. No premiums will be mailed to anyone after the fair. Premiums not picked up at the time of dismissal will be considered a donation to the Society. Exhibitors Note: All entries must be matted on illustration board or equal and with attachment on back suitable for hanging. Framed entries are also acceptable. • 7:00 a.m. – 10:00 a.m. only 4-H Market Hog Arrival: Weighed and penned upon arrival. Must be penned by 10:00 a.m.
• 5:30 p.m. All Market Rabbits must be penned by 5:30 p.m.
• All booths must be completed by 12:00 noon. Judging will begin promptly at noon! • 9:00 a.m. – 12:00 noon Tablescapes set up and entries turned in. Judging begins at noon. • 12:00 noon All Beautification projects must be registered by noon. Judging begins at noon. • 8:00 p.m. Tablescapes Award Ceremony, 4-H Building. Displays may be removed following ceremony. Awards forfeited if removed prior to ceremony. • Midnight: 4-H Livestock may be removed. • 12:00 noon – 4:00 p.m. 4-H displays, booths, and exhibits must be removed from 4-H Building. Any items not picked up will be discarded. 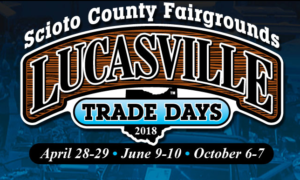 SAWYER BROWN IS COMING TO THE SCIOTO COUNTY FAIR, AUG. 9, 2019! Along with returning favorites, the Continental Circus with two shows on Thursday, Aug. 8, and the Cavalcade of Thrills Demolition Derby on Saturday, Aug. 10. A complete listing of all Ohio fairs is available at www.ohiofairs.org.